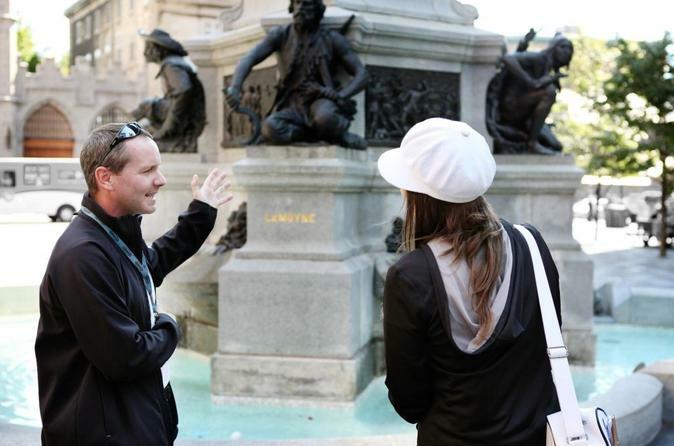 Meet your private guide at Notre-Dame Basilica to start your walking tour of Old Montreal, where your guide leads you through a maze of narrow streets to find a multitude of historical buildings. Explore the birthplace of this city during this voyage back in time. This is a private tour, so the itinerary may vary, but typical sights you'll see can include important public squares such as Place d'Armes, Place Royale, and Place Jacques-Cartier, where you can admire the monuments and works of art on display there. Check out the external architecture of a variety of impressive buildings, such as the three courthouses, the Château Ramezay, and Bonsecours Market (Marché Bonsecours), and visit the interior of other structures like Notre-Dame Basilica, if you wish (any entry fees at your own expense). Pass by Notre-Dame-de-Bon-Secours Chapel and City Hall, and walk along the former 'Wall Street' of Canada, St-Jacques Street. Just off charming St-Paul Street, discover the foundation site of the city's first hospital, Hôtel-Dieu, in the Cours Le Royer. Enjoy a photo op of the Sulpician Seminary, the oldest building of the historic district, and learn about the Old Port. By the time your tour ends, you'll have new appreciation for Old Montreal's long history and landmarks.